So the past two weeks we looked at Complementary Colors - pairs of colors that are directly across from each other on the color wheel. 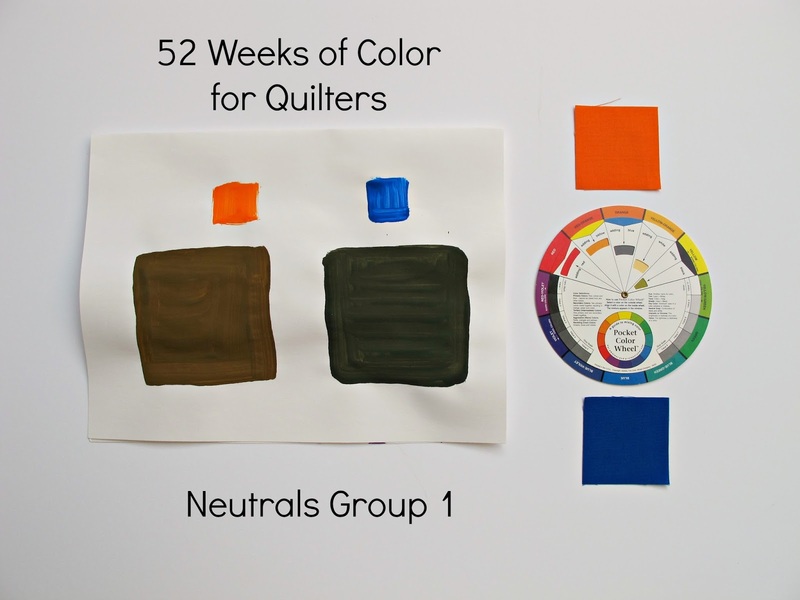 Today we're going to start talking about Neutral Colors, which don't really show up on the color wheel but are vital to mixing new colors which we'll get into more in coming weeks. Neutral colors have no color temperature (in theory) and are made by mixing two complementary colors together. 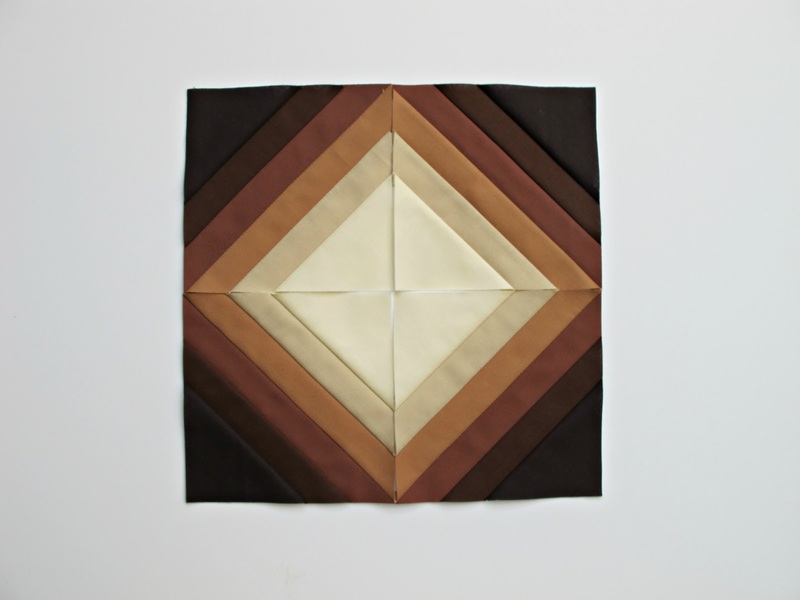 In quilting we often see neutrals used as the background colors or to make other colors really pop - remember that color is relative meaning it will always react to and look different depending on what it is placed next to. My block this week is the string variation 1 on page 237 of 500 Quilt Blocks - I did modify this block to use 6 colors instead of 5. This first arrangement places the darkest brown on the inside. The second version places the darkest brown on the outside corners - funny how different they look isn't it? Third arrangement and I placed the small strings in the middle to make an X type block (which would change again with more blocks repeated). Fourth and final arrangement is this one which rotates the lightest and darkest corners. I haven't sewn these together yet because I've been trying to decide which arrangement I like best - I'd love to hear which one is your favorite in the comments. 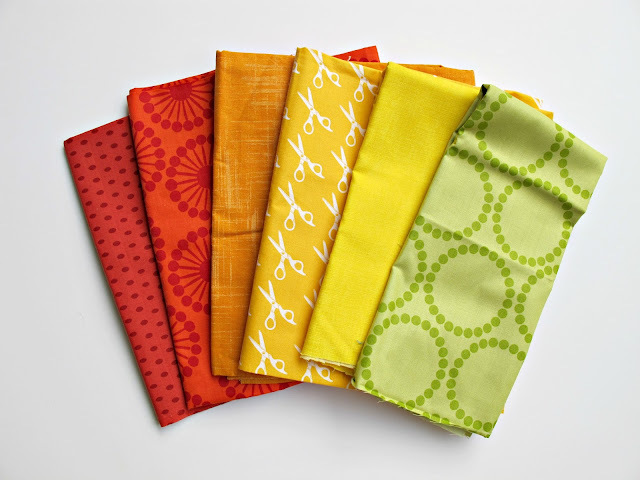 Stash Modern Fabrics is now carrying all 303 colors of Kona IN STOCK! I'm biased because they're a home town favorite for me but it really is so convenient to be able to shop for any color Kona in just one place. And now I feel like I need a coffee and a brownie - teehee. Next week we'll look at the other group of Neutral Colors and I'll show you how I created this modified string block - hope to see you then! 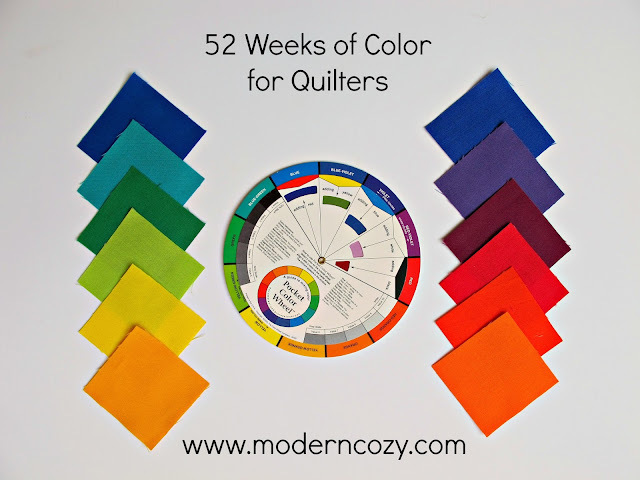 So last week we learned that Complementary Colors are directly across from each other on the color wheel and we looked at pair made up of Primary and Secondary Colors. 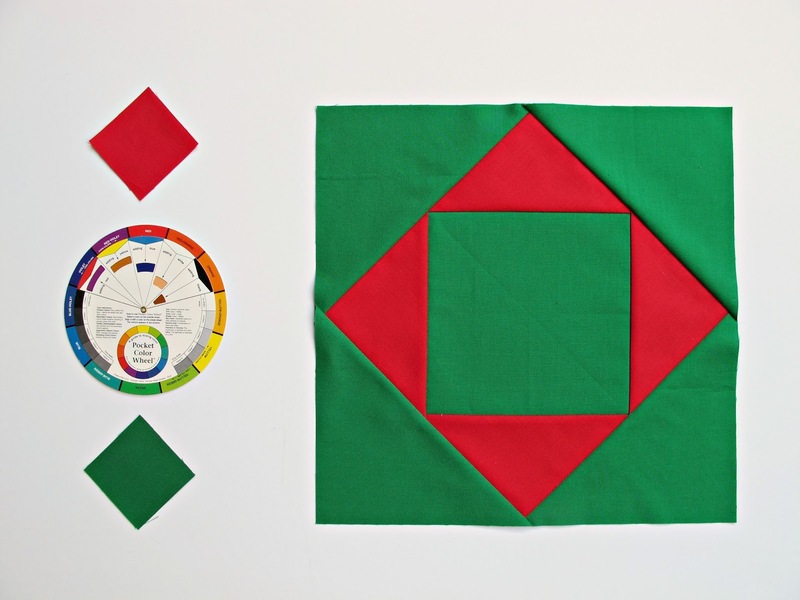 This week we're looking at the Complementary pairs made up of Tertiary Colors. Red-Violet and Yellow-Green (Kona Bordeaux and Chartreuse) and for fun I looked through my stash for fabrics that had both colors represented. 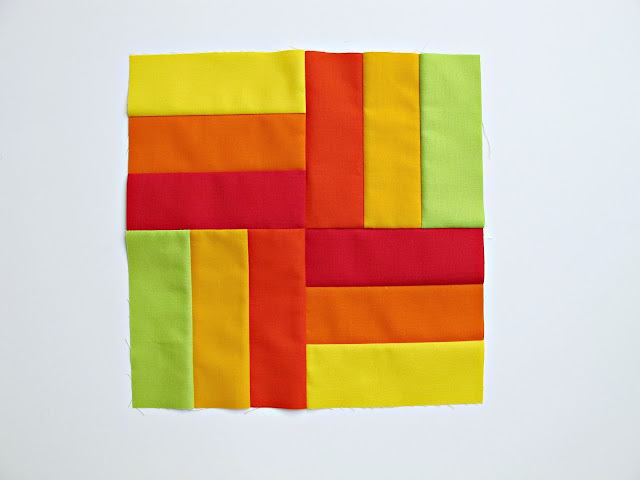 This is the same economy block that I used for last week's blocks. Red-Orange and Blue-Green (Kona Flame Red and Emerald) and another Anna Maria Horner print. Finally Blue-Violet and Yellow-Orange (Kona Deep Blue and Papaya), this was by far the hardest pair to find together in one fabric! I settled on this Amy Butler print - the yellow isn't really orange enough but it was the best I could do. Van Gogh loved to use these colors together, fabric designers not so much. 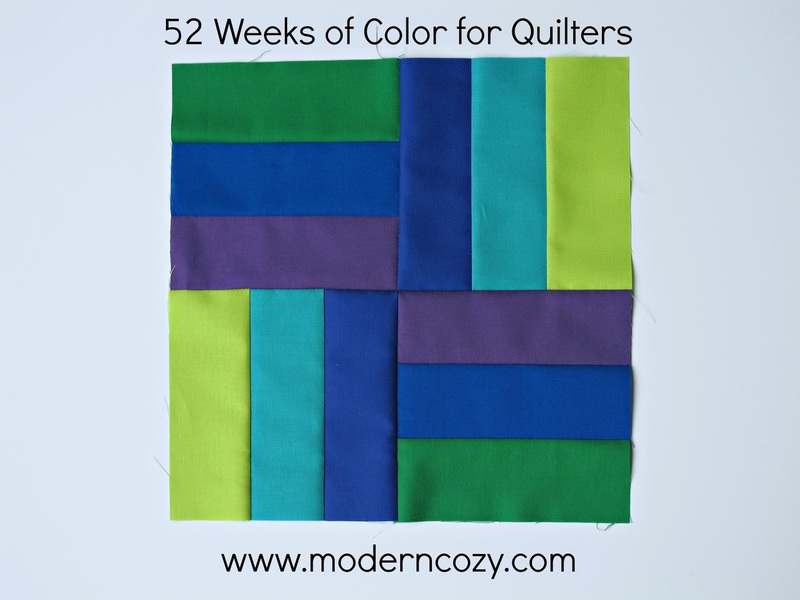 Finally I thought it would be fun to look at all six pairs of Complementary Colors together! I love all these bright, true colors together - nothing subtle here ;-) Next week we'll start talking about Neutral Colors, hope to see you then. Thanks for all the kind comments on this color series - I've had a few no-reply blogger comments so I have no way to send individual thanks to those folks but I wanted to say I appreciate everyone who stops by and takes the time to comment. I'm really enjoying sharing what I know and I'm thrilled that you're enjoying it! 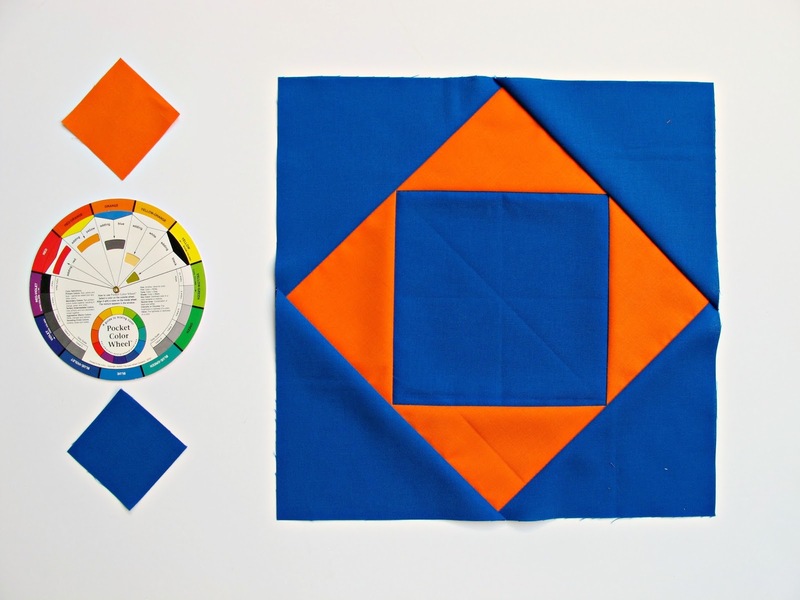 Another Monday, another mini - I feel like this has been the summer of the mini quilt around here. 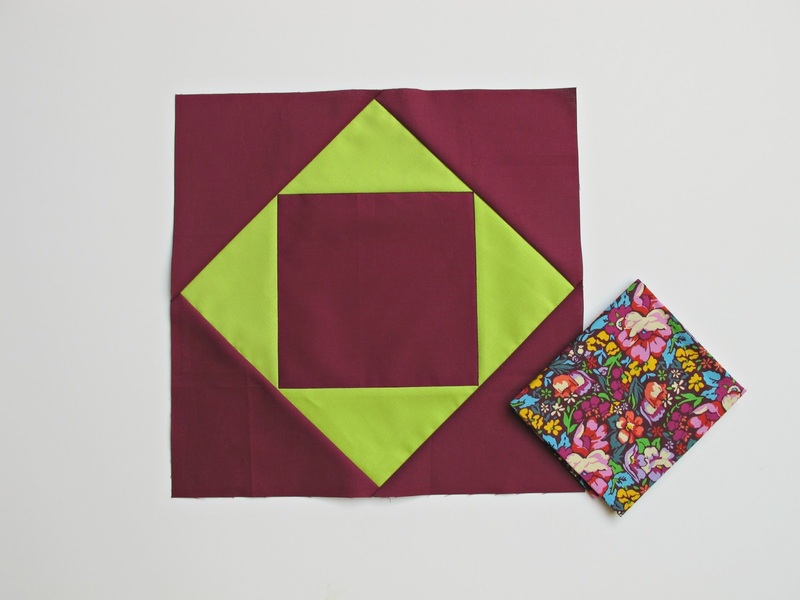 This is the mini I made for the Cotton + Steel Mini Quilt swap on IG. My partner was actually a friend in my local MQG and I was really stressing out over what to make her. I don't know why it's so much harder when it's someone you know but it was! So I hemmed and hawed and thought through about a million different possibilities but in the end I cam back to my original idea - isn't it funny how your gut instinct so often turns out to be the one you go with? This is the Sapphire Mini from Canoe Ridge Creations Fresh Mini Quilt Club (February 2015). It finishes at a large 28"x28" but it's so striking - I love it. The background fabric is Netorious - the white on white print - so it's basically invisible in the photos. 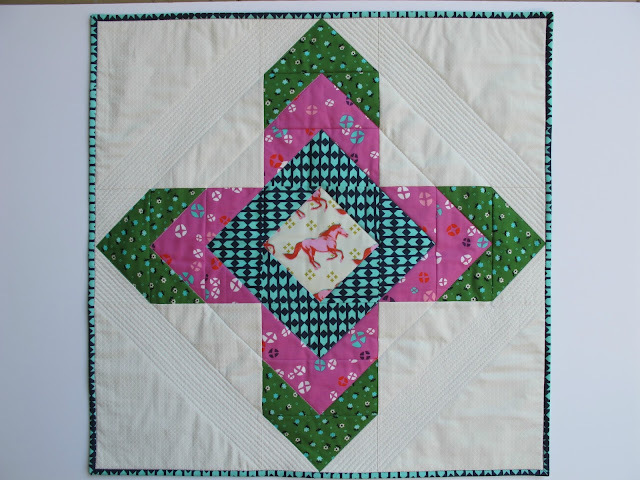 I used some straight line quilting to create a frame that echoed and complimented the center shapes and I was really happy with the effect. Thankfully my partner liked it as much as I did! Got a mini quilt you'd like to show off? Link-up below and thanks for stopping by! So this week we're talking about Complementary Colors and I think you'll quickly realize that you see these pairs EVERYWHERE once you begin to look for them! 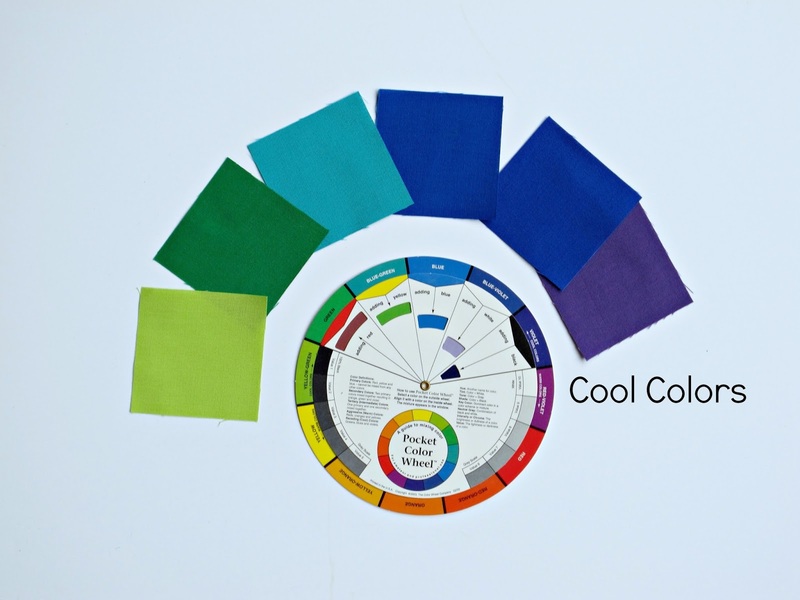 Complementary Colors are directly opposite each other on the color wheel. This week I'm showing pairs that include primary and secondary colors. 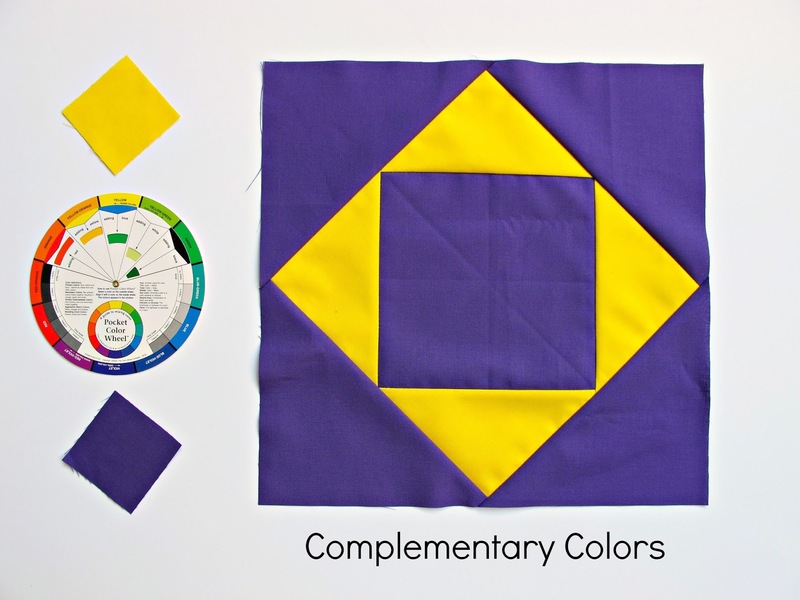 Violet and yellow are our first pair of complementary colors. I used Kona Tulip Purple and Citrus to make these. 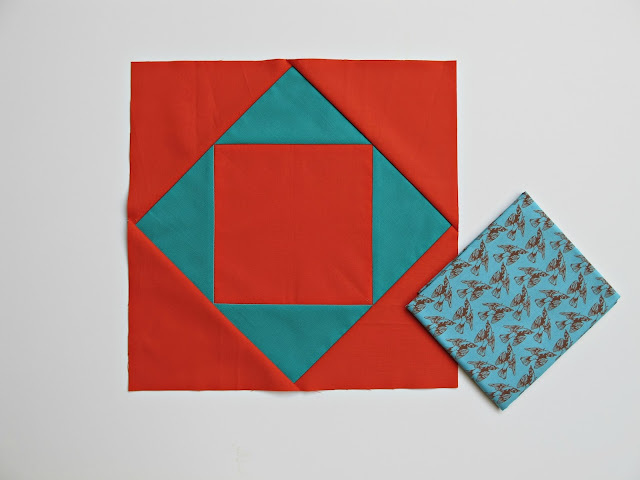 Complementary colors kind of vibrate when placed directly next to each other - they can be almost a little hard to look at when you find the right pair! They are usually an eye-popping combination that is very dynamic. The next pair is blue and orange. Start to think about your favorite sports teams and how many of their colors involve Complementary Colors. I used Kona Royal and Kumquat for this pair. I know everyone recognizes this red and green pairing that screams Christmas. These are Kona Cardinal and Clover. Once you know what Complementary Colors are you can't help but see them used together everywhere! 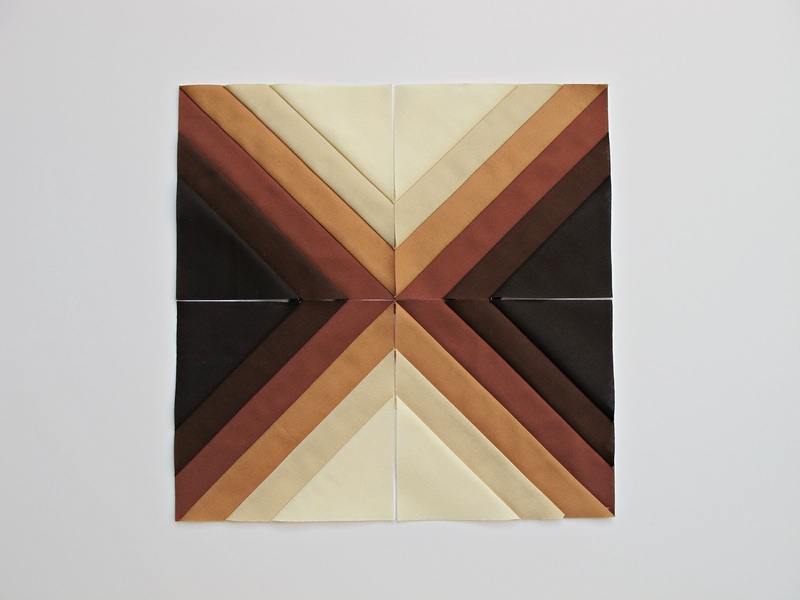 These pairs each have one primary and one secondary color in them. 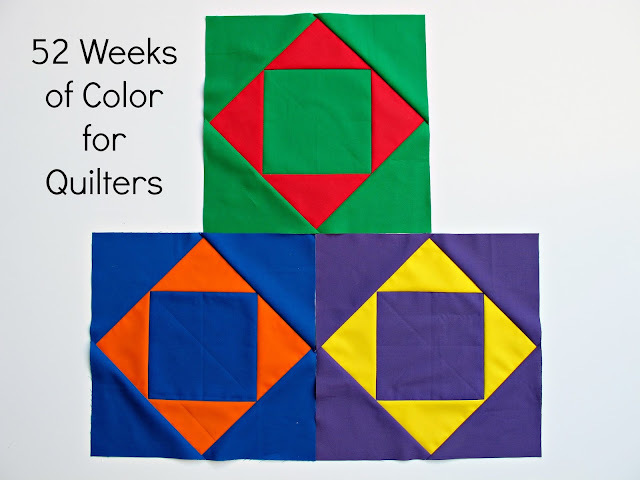 These blocks are Economy Blocks (or square-in-square blocks) and I used this great tutorial to make 12' finished blocks. 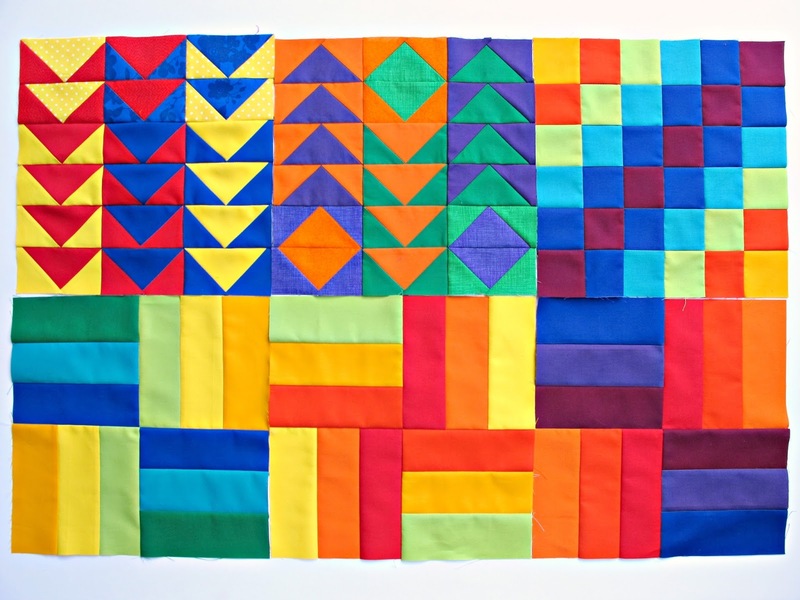 This tutorial gives you the formula so you can create ANY size economy block. Next week we'll look at Complementary Pairs of Tertiary Colors - see you then! Good Morning! This week I have my mini for the Alison Glass Mini Quilt Swap all finished up and ready to share. Last week I shared how I made these blocks and it was so fun rearranging them and trying to decide which one looked best! In the end I came back to my initial vision of fractured blocks and I'm thrilled with how it turned out. Even though each Alison Glass collection has it's own specific palette they all look gorgeous together. I tried to vary my lights and darks/warms and cools to get a good variety within each block. This project started with a FE bundle of 27 AG fabrics and I made sure to include each fabric at least once. I also ended up with enough blocks to make a second bonus mini - for me! I used an Alison Glass print for the border than is white-on-white to give the eyes a little rest. I think this photo was the best I could do on capturing that subtle pattern. 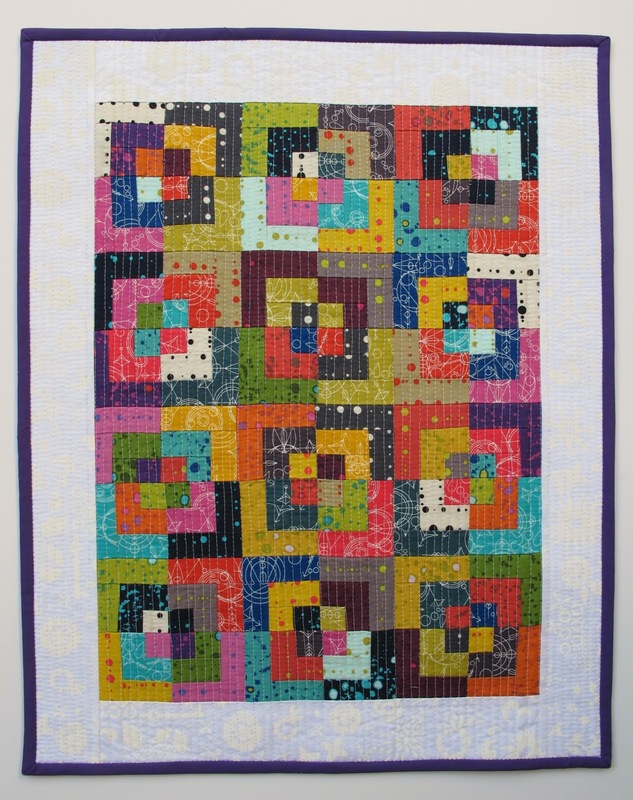 I like the way the white border framed the colorful blocks and really made them pop even more. 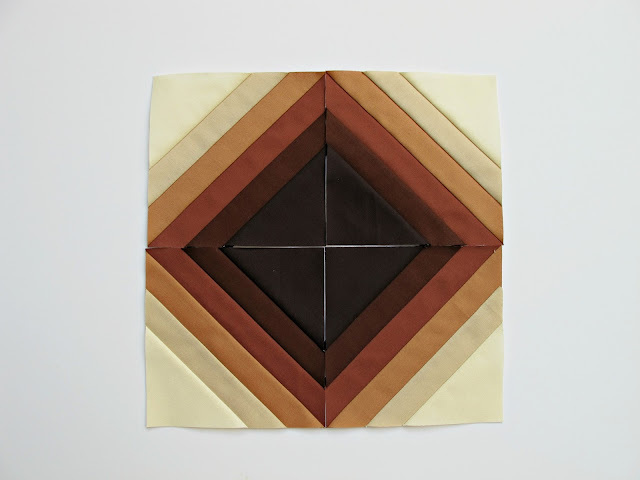 I did some dense straight line quilting and bound it in my partner's favorite color. It's going in the mail to her today and I hope she loves it as much as I do! I'd love it if you felt like sharing a mini or other small project by linking up this week and thanks for stopping by! 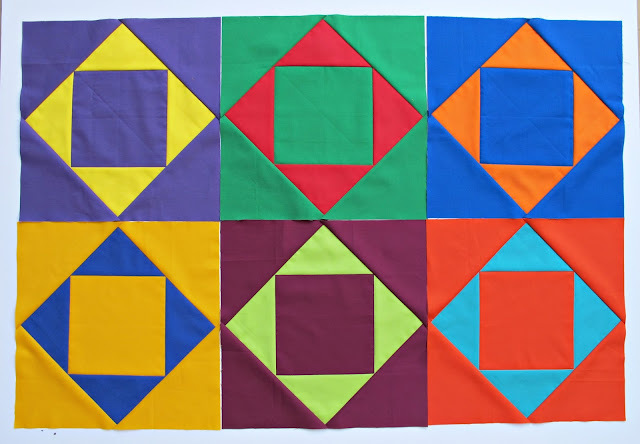 Linking up with Monday Makers at Hug-a-Bit Quilts. Welcome to another week of color fun! This week we're talking about Analogous Colors. 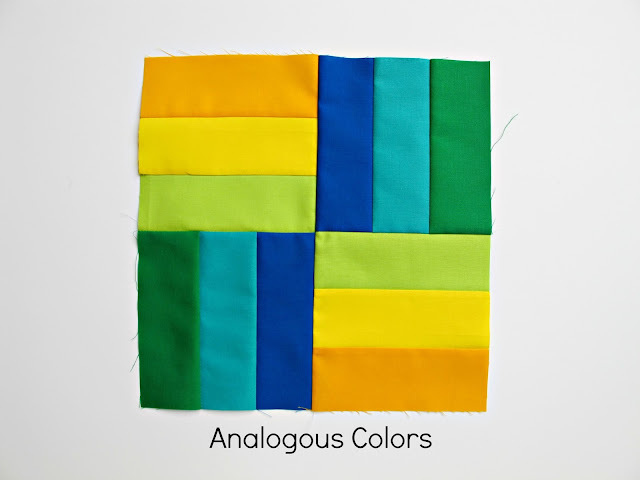 Analogous Colors are any set of colors that are adjacent (or continuous) on the color wheel. In other words these are like the "Connect 4" of the color wheel. You start with any color and as long as you can go from the first color in your set to the last without skipping a color you have a set of Analogous Colors. The Warm and Cool color sets we looked at in the past two weeks were Analogous as well as warm and cool. This week I have not one but THREE examples for you because I am having so much fun making these! For this set of Analogous Colors I started with Blue and then added blue-green, green, yellow-green, yellow and yellow-orange. I love the mix of warm and cool and the pop that the yellow-orange brings to the party. My next Analogous set started with red and then moved to red-orange, orange, yellow-orange, yellow and yellow-green. A pretty classic citrusy palette. 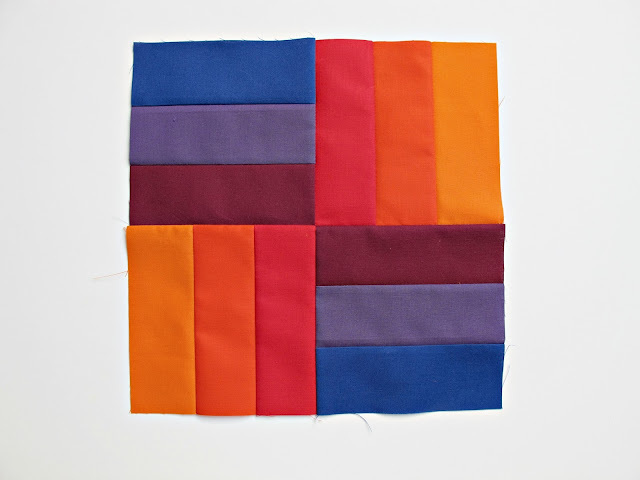 Finally I started with blue-violet for this set and moved through violet, red-violet, red, red-orange and orange. This feels like a gorgeous sunset palette to me. I used six colors in each of my analogous sets but you could use three, four, five, seven - it's completely up to you - they just all have to be connected on the color wheel. The blocks I used for this week are the same as the last two weeks - rail fence made with 2.5" strips. I'm starting to get really excited to see all these blocks together! Thanks for stopping by and hope to see you back here next week. Good Morning all! 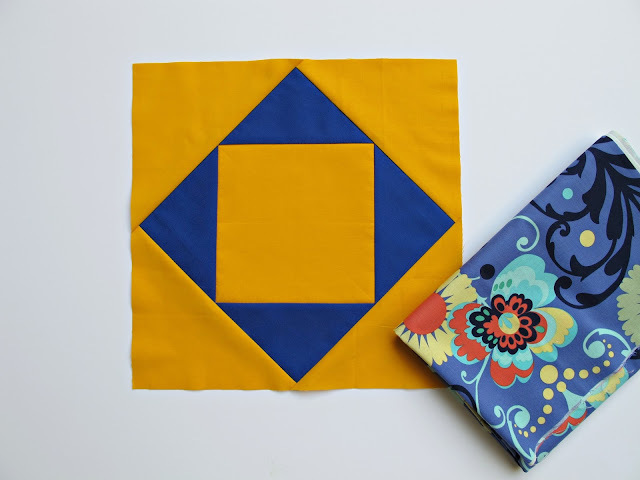 Today I have a quick little tutorial for the block I used in last week's mini. 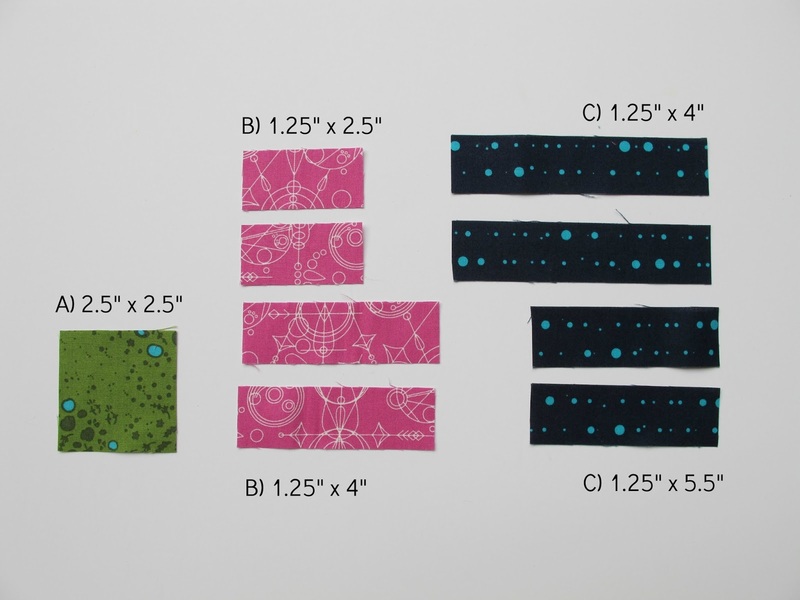 I'm calling it the Quartered Block but if has a "real" name please someone yell it out ;-) So the measurements are shown in the photo above - for the B and C strips you need to cut two of each - I know it looks obvious but I just wanted to make sure it was clear. The assembly is a traditional log cabin type construction - small strips on the top first and then longer strips on the sides. You'll end up with a block that looks like this and measures 5.5". Next cut each block into 4 quarters at the 2.75" mark (for 5.5" blocks). Now the fun part - playing with the arrangements! The more blocks you start with the more fun combinations you can make. This is part of the mini I'm working on for the Alison Glass Mini Quilt Swap on Instagram - I'll show you which version I picked to finish next Monday - hope to see you back here then! Welcome back for another week of colors! This week we're talking about cool colors - these are the colors that recede in a composition and tend to be associated with water or winter. They're considered calming and peaceful. These are the colors on the opposite side of the color wheel from the warm colors we talked about last week. 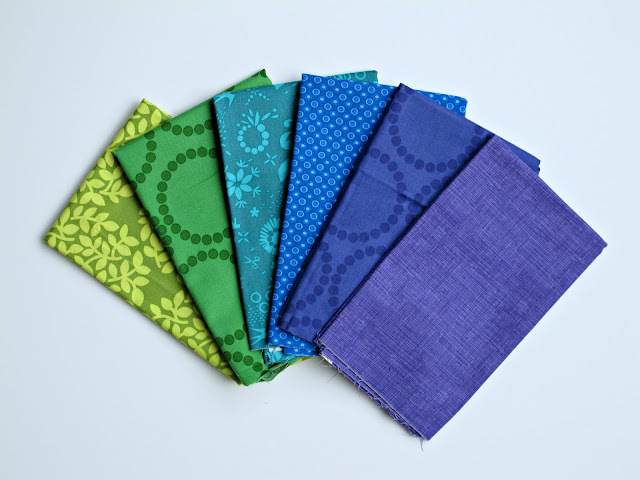 These colors include yellow-green, green, blue-green, blue, blue-violet and violet (purple). They all have some amount of blue in them. 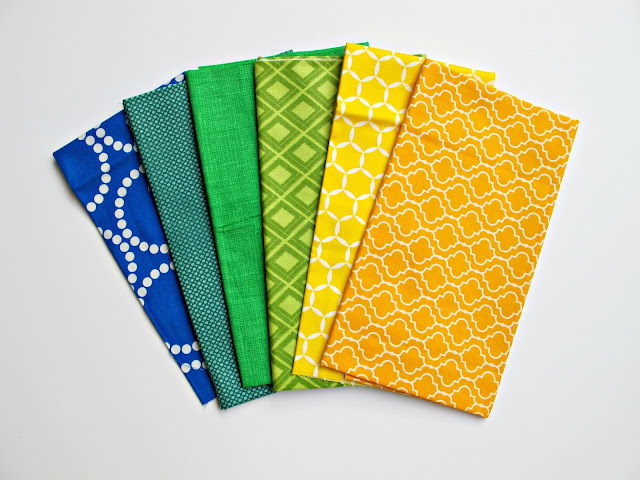 The Kona colors I used this week (in order shown above) are: Chartreuse, Clover, Jade Green, Royal, Deep Blue and Tulip. 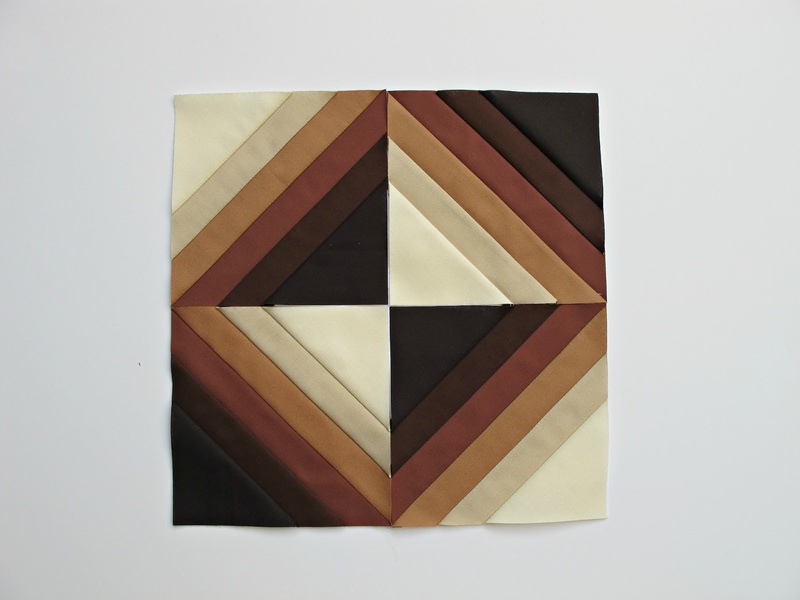 This week's block design is the same as last week's - an enlarged rail fence block. I used 2.5" strips cut in 15" lengths to begin. Today's cool colors shown above in prints from my stash. I'm trying to use tone-on-tone prints which I think read truer to the colors than prints with white or other colors involved. Next week we'll move on to analogous colors, then complementary colors and tints/tones/shades after that - just to give you an idea where we'll be heading in the next few weeks. 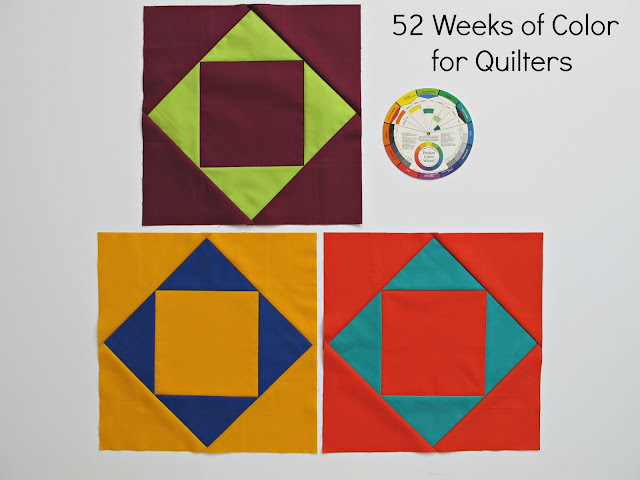 Thanks to Debbie at A Quilter's Table for the mention in her newsletter (full of full info - I'm thrilled each time it lands in my in-box) and thanks to all of your for stopping by and following along! 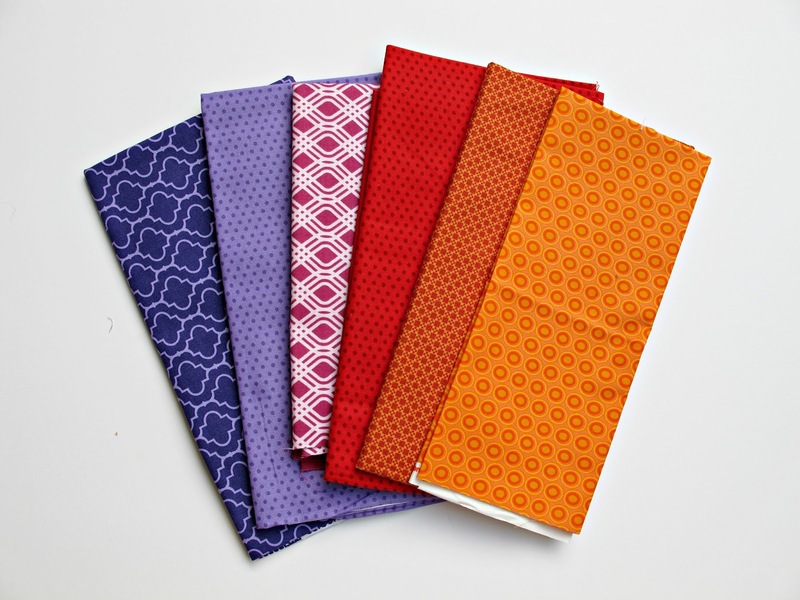 Please tell me that I'm not the only one who makes a practice quilt (or bag or shirt or...) with fabrics you don't stress about before you make the "real" item with those precious fabrics?! I had an idea for my Alison Glass Mini Quilt swap but I wanted to test it first so I used some solid scraps left over from my last project. These solids were a variety with Kona white for the background and Pearl Bracelets for the binding (a new fave for binding). This mini finished up at 15" x 22". I made small blocks-in-blocks (I'm sure there is an actual name for that kind of block but I don't know it). I cut each block into 4 quarters and then reassembled them. This was my first time setting the blocks on the diagonal and I'm happy enough with the result that I'm going to cut into my precious Alison Glass fabrics next! This won't be the arrangement but I figured I needed something to be a surprise :-) If anyone is interested in a quick tutorial let me know and I'll take pictures as I work on the next one! I made four blocks but I only used three - I'm saving this little guy for a special project all his own. Thanks for stopping by and please feel free to link up your mini quilt (or any small project) you'd like to share! This is a Flickr badge showing public photos and videos from darcydivine. Make your own badge here. © 2012 - 2014, Modern Cozy. Simple theme. Powered by Blogger.